As the Director of Marketing and Communications since February 2018, George Joe oversees the College’s marketing, recruitment and communications operations. He has a bachelor’s and a master’s degree in English, plus a Master’s in Education (Leadership) — each from Northern Arizona University (Flagstaff, Ariz.). He is currently working on an M.B.A. Joe has spent more than 20 years in marketing, media, journalism, publishing and public relations. 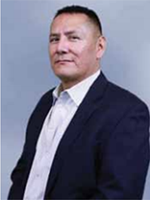 Additionally, he has served as a board member at Northland Pioneer College and Dilcon Community School Board President, and as a member of the Diné College English faculty. 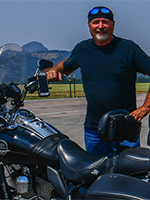 Bernie Dotson moved to Gallup, N.M., in 2009 and worked for the Gallup Independent as a city hall and sports reporter and was a member of the Independent’s editorial board. Dotson has a master’s degree in International Relations from the University of Miami (Coral Gables, Fla.) and a bachelor’s degree in Humanities from Michigan State University (East Lansing, Mi.). Prior to the Independent, Dotson worked at newspapers on the East Coast. Dotson writes news releases, copy edits, works with the communications team in content writing, assists with newsletters and serves as the official spokesperson for the College. Ed McCombs started at Diné College in 1985 when it was called Navajo Community College, the name changed back in 1997. Over the years, McCombs has worked in various capacities in Communications and marketing and oversaw Diné College Press. Ed is the College’s official photographer. McCombs creates and produces design concepts and products while maintaining the continuity of Diné College’s imagery and branding. Among other duties, McCombs designs the school calendar, newsletters and other graphic documents. Vale Adakai has been with Diné College since the year 2000. Adakai has a degree in computer science information systems from Fort Lewis College (Durango, Colo.). Adakai updates the College website, outside displays, works with the communications team to send out the Diné College TODAY e-newsletter, assists in the posting and contributing to social media sites such as Facebook and YouTube and works with the communications team to create videos. L.A. Williams is a long-time radio personality around the Navajo Nation. She has worked for KTNN(Window Rock) for years and is originally from White Cone, Ariz. She is a graduate of Holbrook High School and is the program manager at Diné College’s KXWR (92.1) radio station. KXWR has been on air since 2012. The station is locally broadcasted and is available as a download. Jerry Jim is the technician at KXWR. Jim has a bachelor’s degree in electronics from Devry Institute of Technology in Phoenix. He is a former IT director and has previously worked for KTNN in Window Rock for five years. Gwendolyn Sam is the recruiter for Tsaile Campus. 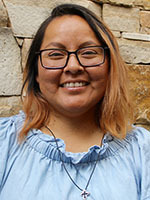 Esther Paul has been with Diné College since 2012. A former Diné College student, Paul has since transferred to New Mexico State University to study Biochemistry. She has worked in several science research labs, and is a Sunday School Teacher and a musician. She says she enjoys connecting the Navajo Nation to higher education.